Dominique Strauss-Kahn appears in court Tuesday, Aug. 23, 2011. MANHATTAN — Embattled French pol and IMF boss Dominique Strauss-Kahn broke his silence on French TV, saying that his encounter with a maid at a Midtown hotel was a moment of "moral weakness," according to CNN. In an interview set to air Sunday with French television station TF1, he said that the incident at the Sofitel did not involve violence, aggression, force. Instead, he said that it was "an error, a mistake — a mistake concerning my wife, my children, my friends" as well as an affront to the French people, according to the report. Sexual assault charges against Strauss-Kahn were dismissed last month after prosecutors began to doubt the veracity of accuser Nafissatou Diallo's statements both about the incident and her background. In May, Strauss-Kahn was accused of sexually assaulting Diallo and then trying to flee the country in an incident that sparked an international uproar. But the case began to crumble in the months that followed, leading to an ugly series of exchanges between prosecutors and Diallo's lawyer, Kenneth Thompson. 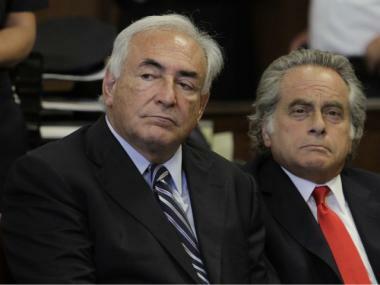 Strauss-Kahn was ultimately released, first from jail and then from house arrest. The Frenchman left behind his $50,000-a-month rental on Franklin Street in Tribeca to travel back to France, arriving earlier this month to cheers. However, he still faces a civil suit from Diallo and accusations of sexual assault from author Tristane Banon.